[Taipei, Taiwan] The world's 2nd largest B2B PC exhibition known as COMPUTEX TAIPEI 2018, will run from June 5th to June 9th. Today, the 2018 COMPUTEX Best Choice Awards winners were announced. Winning 5 awards with 4 different products, MSI clearly stood out as the unanimous winner over more than 350 honourable competitors: MSI Optix MPG27 Series Curved Gaming Monitor wins “Best Design Award”& “Category Award”, MSI FUNTORO FMS for Telematics Application receives “Golden Award”, MSI GE73 Raider RGB, and MSI FUNTORO Stadium & Arena Solution both wins “Category Award”, again proving MSI’s world dominance in the field of Gaming and Platform Service. “MSI understands that the development of the gaming industry will never stop. For individual gamer and eSports team, our gaming products will surely lead them to win every battle. We are delightful and humble that MSI Optix MPG27 gaming monitor series win double honours in both Best Design Award & Gaming Category Award in COMPUTEX 2018. In addition, MSI FUNTORO FMS for Telematics Application, an elaborate and long-term running commercial business project, also gets jury's attention and wins golden award with it sophisticated software and hardware technology integration. MSI will continue to break the design limit and bring everyone more amazing innovations," says Sam Chern, MSI Global Marketing Assistant Vice President. MSI Optix MPG27C/ MPG27CQ is the first Curved Gaming Monitor with SteelSeries GameSense built in, and featured with a 144Hz refresh rate and 1ms response time VA LED panel which has the most benefit in fast moving game genres. Using the several RGB zones on the front and back, gamers can easily program lighting effects in SteelSeries Engine to notify them of in-game timers or cooldowns, discord notifications or other important information they want at-a-glance. MSI also has received an intellectual property protection in the form of patent TW-M556865 for Optix MPG27C/ MPG27CQ. This patent serves to further protect MSI Curved Gaming Monitor surrounding its Status Display Module, Microcontroller and Communication module. MSI understood that the Gaming industry is not always static, and will continue to grow and evolve. Its forward-thinking allows gamers to focus on their victory, knowing that MSI will take care of the rest of things. 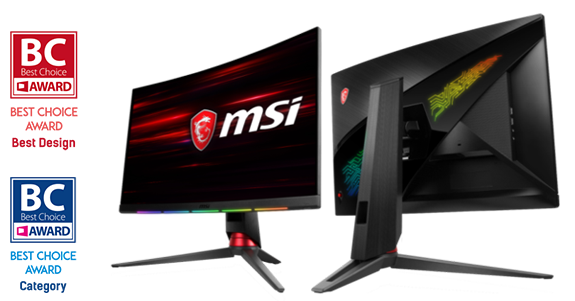 MSI Curved Gaming Monitors are positioned to deliver the benefits of these advancements to gamers and users. Extensively applicable to different types of vehicles, FUNTORO Fleet Management Cloud Platform provides transportation sector a smarter way to control their fleets by inducing latest technologies including multiple sensor integration, big data analysis and deep learning. Applications such as vehicle tracking, proactive event notification, SOS warning message, ADAS integration, driver behavior and cargo safety monitoring can bring great values to customers and improve operational efficiency along with company profit. Currently FUNTORO Fleet Management Platform has been approved and utilized by major car manufacturers and top 5 bus operators in Latin America, Europe and Asia. To lead the trending RGB master race, the GE Raider features an astounding LED backlight cover as part of the Mystic Light system. These 16.8-million-color lighting can be customized to as detail as 24 separate zones, or even to match with the Per-Key RGB lighting of the SteelSeries gaming keyboard. For the first time, gamers will be able to show their in-game status with their teammates, like ammo, health, and much more. The eye-catching design now not only adds style, but also opens up more possibility throughout gameplays. MSI GE Raider is well-equipped to power both the 120Hz 3ms gaming display or the 4K IPS-level display. Such performance is made possible with the exclusive Cooler Boost 5, a dual-fan 7 copper heat pipes cooling design, all to offer the most stable yet premium experience. With Nahimic 3, Killer networking, Giant Speaker, and much more, the GE Raider comes with more exclusive features plus latest technology under the hood. Both gamers and power users alike can take advantage of the well-refined powerful laptop to enjoy huge boost in gaming experience and productivity. The GE73 Raider RGB undoubtedly stands out from the crowd; is surely a choice that’s too shiny to ignore. With industry-leading technology and deep market insight, FUNTORO Stadium & Arena Solution features a series of new innovations and business models for sports venues. With the precise allocation of Portal / Content/Media Server & Fail Recovering mechanism, the Stadium Solution can provide best services in a most stable & efficient way. Furthermore, FUNTORO Stadium & Arena Solution not only provides fans with unmatched VIP experience, but also create new revenue streams by integrating sports team merchandise shopping, food & beverage orders, advertising system into a total platform that brings sports club high ROI, continuous revenue-generating mechanism, market attention and brand image. 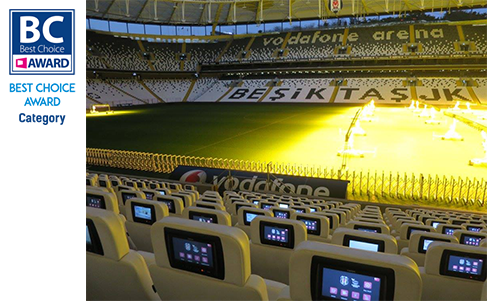 With FUNTORO Stadium & Arena Solution implemented in Besiktas - Vodafone Park, the stadium has been selected as the venue to host 2019 UEFA Super Cup, which indicates that the quality, design, and stability of FUNTORO Solution fit in the highest professional sports event in the world. The whole system is 100% designed by FUNTORO R&D team, which stands for the high level of flexibility for software integration and application. Besides, with the help of smart Central Console & Cloud System, venue management team can take full control of services including live streaming, highlight replay, advertising system, merchandise shopping, MVP voting and interactive events with minimum human resource. FUNTORO makes venues smarter, more profitable in the most effective way.